With the turn of the calendar to a new month comes the routine cycle of economic readings from the month just completed. 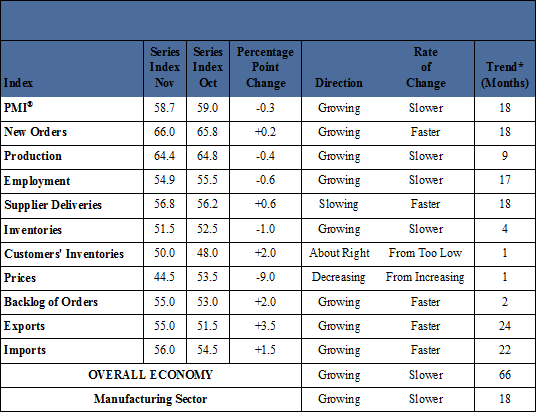 One our favorite data points – the Purchasing Managers’ Index (PMI) – is of particular interest to us for it is both highly correlated with the economy at large and its New Orders component is a very good leading indicator of future activity. ”“The past relationship between the PMI® and the overall economy indicates that the average PMI® for January through November (55.8 percent) corresponds to a 4.2 percent increase in real gross domestic product (GDP) on an annualized basis. In addition, if the PMI® for November (58.7 percent) is annualized, it corresponds to a 5.1 percent increase in real GDP annually. Solid export orders. This is impressive in the face of a weak global backdrop and suggests the competitive shift to U.S. based manufacturing continues to unfold. Also, employment remains healthy, and while inventory levels are being reported as moving higher, the “about right” direction from the table below suggests they are not at troublesome (excessive) levels. Finally, the sharp drop in input prices – which pushed the overall Index level a bit lower – represents, in our book, a very favorable development. Some worry lower oil prices will dampen domestic capital spending on shale oil and gas projects and this development will slow the expansion. We believe, however, that the beneficial impact of lower oil prices across the rest of the economy will represent a major boost to economic activity in the months ahead. Falling commodity prices (oil in particular), low inflation, low interest rates, a recapitalized banking system and aggregate consumer balance sheet, and solid, if unspectacular, economic growth, represents a very favorable elixir for the stock valuations and the continuation of the bull market.